A few weeks ago, I made a trip across the border into white rose territory to check out George's British Kitchen in Leeds. I love a little trip out, and found the train journey oddly soothing after a busy few weeks. I was so ready for an afternoon of relaxation, and this was the perfect antidote. We walked into George's to be met by a chirpy young lady called Erin, who led us through the beautifully seaside themed restaurant to a booth which resembled a beach hut, complete with toy fish knocking about the rafters. 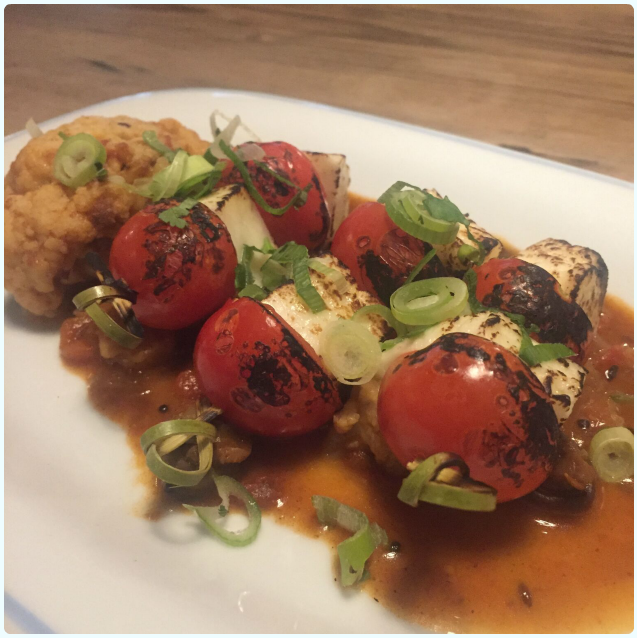 Halloumi skewers - grilled using our charcoal grill and served on a bed of cauliflower and mushroom curry: Big fan of halloumi, with it salty squeakiness. Perfectly light, and paired brilliantly with mushroom curry. Who knew that was a match made in heaven? Ideal if you're planning on stuffing your face with a carb-laden main. 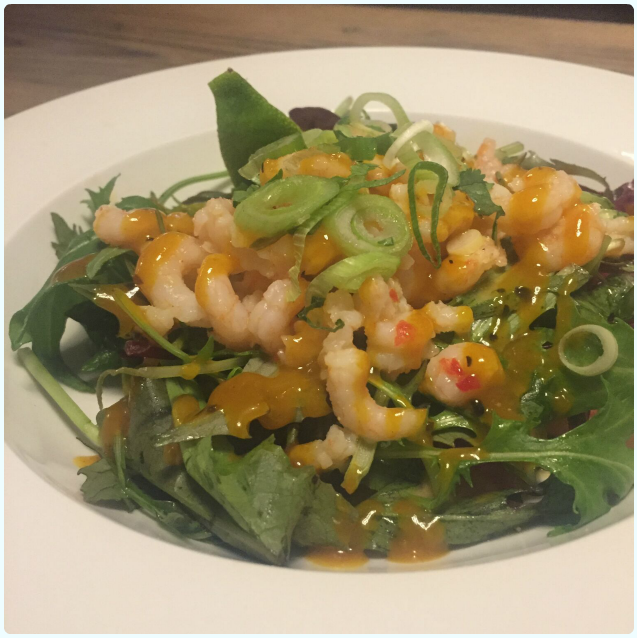 Chilli shrimp and mango chutney salad - fresh tomato and lime salsa, topped with baby leaf salad and hot chilli and garlic shrimp. Finished with smooth mango chutney and chopped spring onion and coriander: Tasty little shrimp in a sweet sauce, with a little hint of chilli in each bite. 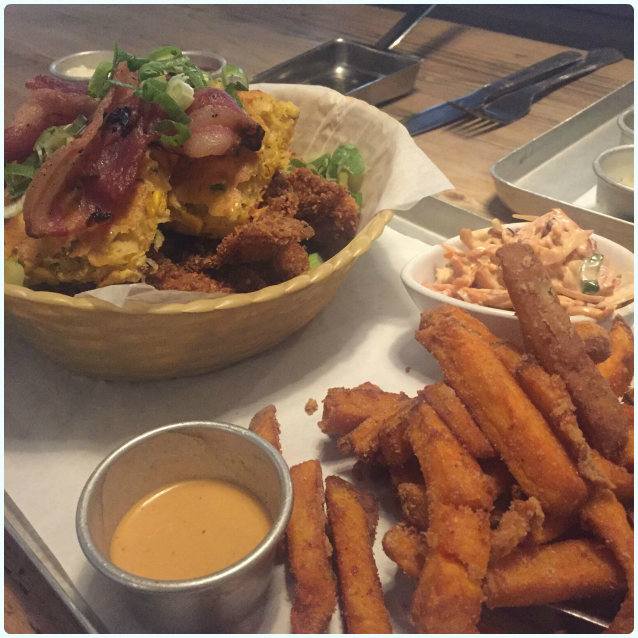 Chicken in a basket - tender chicken fillets in a light lemon pepper breadcrumb coating, served with sugar grilled smoked bacon, sweetcorn pancakes, campfire coleslaw, twice cooked chips and a spicy mayo dip: This was the kind of comfort food I had in mind. Thick cut sweet potato fries and Southern style chicken. My only feedback was that the bacon needed a little longer to get that crunch which would have been perfect. Minor. Wild ocean cod - 100% sustainable tender fillet of cod, sourced from the clear waters of the Norwegian and Icelandic seas. 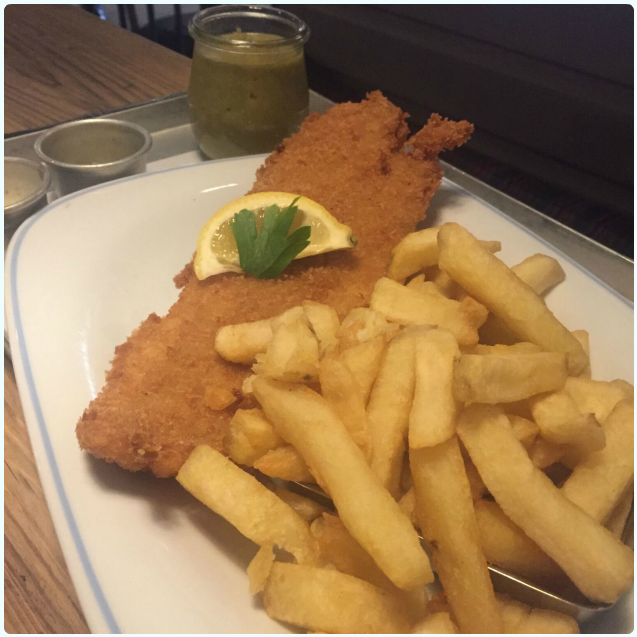 Served with twice cooked chips, mushy peas, chunky tartare sauce and a few pickles: You really do miss out on the scale of this fish on this picture. If you enjoy a good fish, you'll be thrilled with this. Simple, yet more than effective. 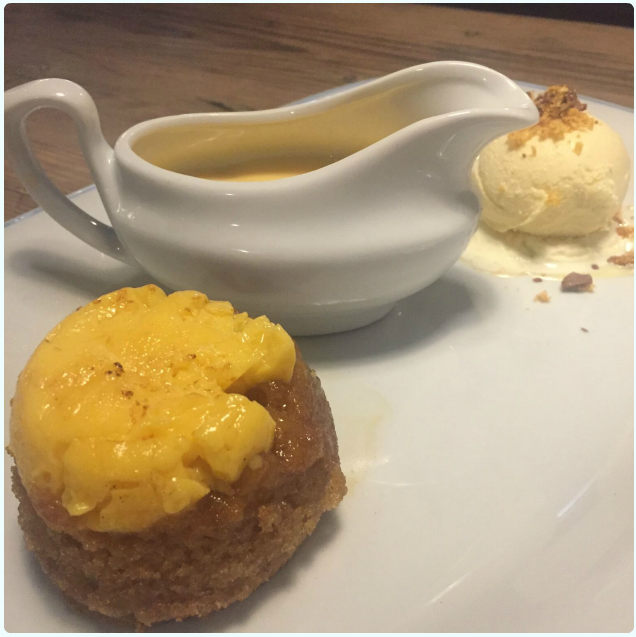 Steamed sticky ginger pudding - steamed sticky ginger sponge pudding filled with vanilla mousse, served with a jug of vanilla custard and homemade golden syrup ice cream: The wind was blowing, drizzle was in the air, and I was feeling a little mard. Ginger pudding cures all of these afflictions, it appears. Also, please note the addition of ice cream and custard. Not one or the other... both. 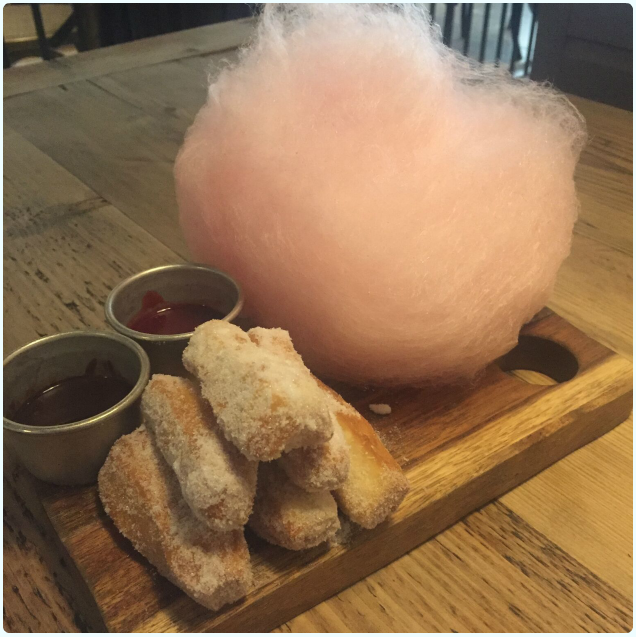 Doughnuts - fresh homemade doughnuts with a chocolate dipping sauce, raspberry dipping sauce and candyfloss on the side: When I was little, trips to the seaside were incomplete if we didn't get a bag of doughnuts on the sea front, fresh from a fryer, filled with dark (probably filthy) oil, which seeped through the paper bag and scalded your hands. These doughnuts were far too superior! I wasn't complaining though. Again, candyfloss! Go to George's for a chilled afternoon with lovely food and a great choice of cocktails. 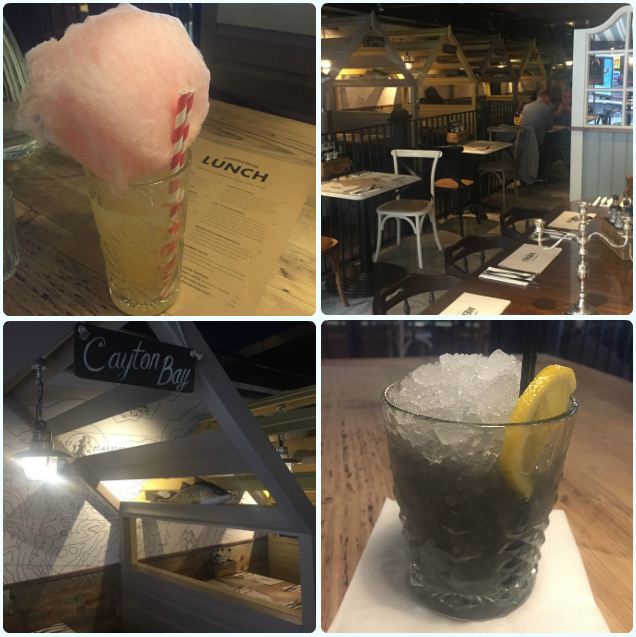 I adored the decor, and genuinely enjoyed the company of the front of house staff. Thanks for a lovely afternoon! Disclaimer: I was invited to the restaurant to complete an honest review. I was under no obligation to say nice things!